I drove 272.5 miles in one day, in a car. Okay, in an electric car, in the UK, in 2012. Sounds rubbish. I can do 550 miles on a tank, takes 2 minute to refill. And your electricity comes from burning coal. So your green electric car is actually dirtier! Oh right, that old chestnut. It’s true! You green fascist! It’s nearly true. About 30% of our electricity comes from burning coal. The rest is from natural gas, nuclear and renewables. Plus a lot of electricity is used to refine petrol and diesel. So, we burn coal to make petrol to burn in our cars. The electric car uses less electricity per mile than a petrol or diesel car. Rubbish, that’s a green fascist lie. It’s a very well established fact. Anyway, to drive that far you would have to stop and re-charge the batteries every 40 miles which would take, like 8 hours. 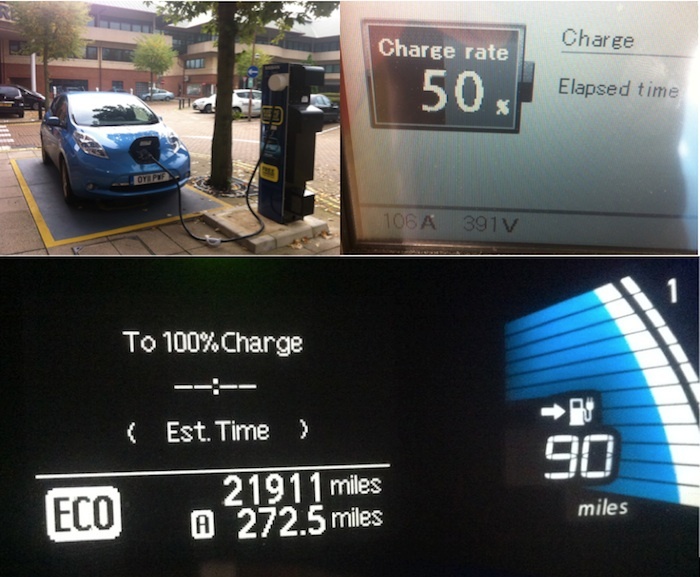 I re-charged every 60 or 70 miles and it took ten minutes, using a fast charger like the one in the picture. Oh yeah, well, fast chargers ruin the battery, you’re going to have to replace your green battery after 5,000 miles and it’s going to cost £40,000. If you only ever use a fast charger then the battery life will be shortened, but I use them 3 or 4 times a month so it makes little or no difference. 90% of electric car drivers charge their cars at home 90% of the time. The battery will last well over 100,000 miles and can be entirely re-furbished by the manufacturer re-using 95% of the components. Cost estimates are in the £5,000 to £8,000 bracket. The average fossil fueled car will cost at least that much in servicing over a 100,000 miles, plus of course the cost of fuel. Still insane if you ask me. An electric car will cost around £1,500 to charge when driven 100,000 miles. An economic petrol model of the same size that can average 50mpg will cost £12,000 in fuel alone. They still cost too much to buy new. After 40,000 miles, a Nissan Leaf is cheaper to buy and drive than a Ford Focus 1 liter ecoboost. After 100,000 miles it’s embarrassingly cheaper. Yeah, whatever. They are still rubbish. Fair enough, just wanted to get the facts out there. Indeed, have you taken your pills today?